Boy, has Boeing gotten a good return on CH-47 Chinook design. For half a century, these things have been getting the job done for the U.S. Army and over 20 militaries around the globe. This unique view of one of these amazing machines going about its business makes it all look so easy and simple. The video below was shot by aviation photographer Sam Whitfield. If you’re interested, be sure to check out all of his other work at www.samwhitfieldphotography.co.uk. 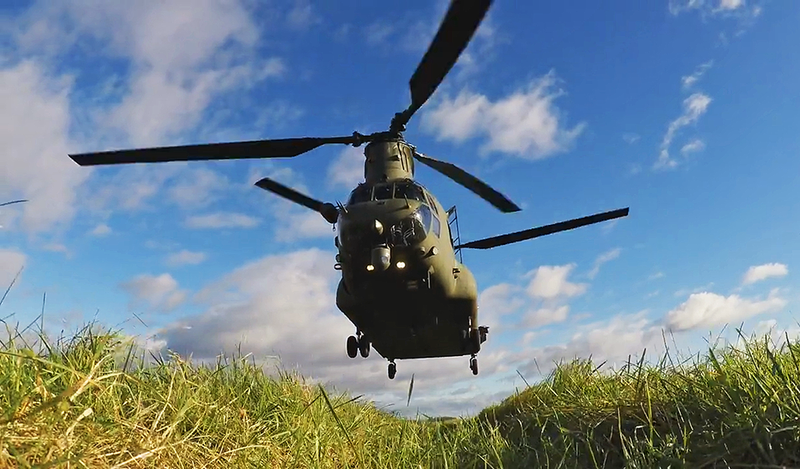 The video was shot on the Salisbury Plain Training Area in the UK, and the aircraft featured is a Royal Air Force Chinook. These $30 million beasts keep wracking up the orders, both in the U.S. and abroad, and even its latest variant, the CH-47F, will be getting more updates in the coming years. This upgrade, known as the CH-47F Block II, will aim at gaining back performance lost due to weight gain over the Chinook’s lifespan, and making future upgrades easier. A new transmission, rotor system, as well as electrical and structural upgrades will set the stage for an engine upgrade option in the future. It will also bring the CH-47F closer into commonality with the legendary Special Operations variant of the Chinook, the MH-47. With a clear pathway being set to keep the helicopter relevant and modern in the coming years, there is little doubt that CH-47 production will exceed 1500 units by the end of decade and continue on from there without any end in sight.